While most Hungarian Internet users consider Hungarians generally pessimistic, passive and procrastinating, 89% still think that they can be successful as a Hungarian. And the digital world offers new opportunities for success: one third of Internet users know someone who has changed their life spectacularly using digital tools. These are the conclusions of research conducted in October 2018 by eNET – Telekom, in the series titled “Report on the Internet Economy”. Hungarians are pessimistic, at least in the opinion of most adult Hungarian Internet users, as indicated by eNET’s research conducted in October 2018. We are apt to look at the dark side of things, don’t do our best to reach our goals, and have little confidence in ourselves. This are the perceptions of 61-71% of the respondents. While the majority deem these stereotypes valid, Internet users also express a need for change, and the desire for fresh attitudes. Even though we Hungarians paint a rather dark picture of ourselves, eight out of 10 Internet users always or usually feel proud when hearing about outstanding achievements by Hungarians. Almost all respondents agree that we still have compatriots who prove that Hungarians can be successful, too. It’s primarily athletes who are referred to as examples, but a start-up IT business as well as a doctor and biologist have also been mentioned. In our world increasingly interwoven by digitalisation, one of the keys to success involves the usage of digital technologies. One third (34%) of Internet users have seen how a person can achieve a spectacular change in their life using digital tools and solutions. As to the changes brought about by those tools and solution, 58% cite new and better work opportunities, and 51% claim that digitalisation has generally made life more comfortable. 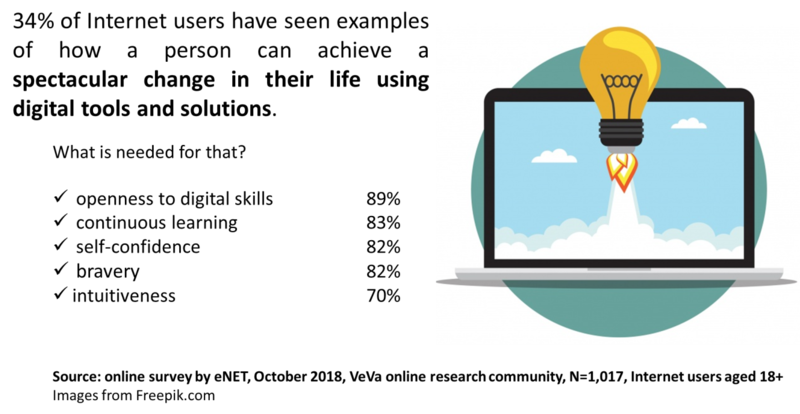 A growing network of connections, as well as opportunities for active social and work relations are seen by 42% as further benefits of the digital world that improve one’s quality of life. The share of Hungarians who use the Internet is right for the European average. However, their digital skills are lagging behind, as indicated by research conducted by eNET and Telekom in October. But there is a need for change: seven out of 10 Internet users consider it important for Hungarians to be first at utilising the opportunities of the digital world, and two thirds say that everybody should be part of that world. And what is needed if a person is to achieve a major change in their life-style and quality using digital tools? Internet users say that openness to acquiring digital skills is the key. That positive attitude is ranked higher by the survey participants than other important characteristics like self-confidence, bravery or intuitiveness.